Celebrities are wearing our monogram necklaces! Carolina Clover partners with Celebrity Monogram Jewelry Designer Jane Basch to create custom looks in monogram necklaces! Jane has designed jewelry for celebrities such as a mommy necklace for Kendra Wilkinson, a monogram for Taylor Swift, a nameplate necklace for Christina Applegate. Now Jane's design workshop can design your custom monogram necklace, earrings, bracelet or charm. We are thrilled to offer her professional design to our Clover customers and the value and quality in her custom monogrammed jewelry is unbeatable. For a custom piece of jewelry in your size, metal choice and style made just for you her designs are surprisingly affordable. Now some designs to add to your wish list...go ahead, PIN THEM!!!! Click on the image/text to go to CarolinaClover.com for more information on these custom jewelry pieces! Kaley Cuoco wears a Jane Basch Lace Monogram Necklace available for purchase at CarolinaClover.com. Gossip Girl's Nelly Yuki Wears Jane Basch Designed Monogram Ring available at Carolina Clover. Carly Rae Jepson wears her Jane Basch designed necklaces available at Carolina Clover. 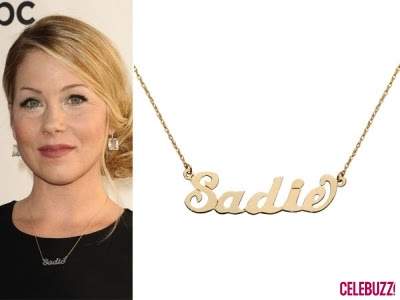 Christina Applegate wears her nameplate necklace with her daughter's name available at Carolina Clover.